"Wow," I murmured, "I can't believe I'm actually here." Miranda, who was standing beside me, nodded. We both gazed at the mosaic flowers lovingly laid across it's smooth surface. "It is neat to be here, huh, Lee?" Miranda asked quietly. I nodded. "Yeah, really neat." My eyes still on the blue and white mosaic, I backed up slowly and sat down on a bench nearby. A husky man was there already, and he was to my right. "He was some guy, that Lennon," the man said to me. I smiled faintly, and nodded, tears forming in my eyes. The mosaic blurred. 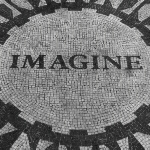 The IMAGINE mosaic was every bit as beautiful and magical as I'd thought and hoped. John Lennon deserved to be honored and remembered in this way. My name is Leeanne Baker (but everyone calls me Lee), I'm 19 years old, and I'm a really big Beatles fan. I have all of their records, and consider myself a 'Beatle expert' because I know a lot about them. I love all of their songs. My favorite at the moment is "In My Life". My favorite Beatles are John and Paul. My friends tell me I have to have just one favorite, that I have to like one better than the other. And I tell them that I like them exactly the same! I do. It's kinda strange, I think. I'm kinda from the wrong time period. Yeah, the year's 1985. The Beatles have been broken up for years (they broke up in 1970, you know). I was only four years old, but I remember (believe it or not) hearing about the break-up on the radio. Mom and Dad like the Beatles a lot - that's where I got my great taste in music - and I remember them explaining the break-up to me. As I grew older, I hoped for a reunion of my favorite band, as did other Beatle fans. But I guess it was just not meant to be. On that night in December, all of our hopes and dreams were shattered as John Lennon was murdered, in 1980. I can still remember the radio announcer's voice as he stated the grim fact. I was 14 at the time, and boy was I crushed! At first, I didn't believe him, but then the reality sunk in. My John, my hero, was gone. I couldn't listen to my Beatles or Lennon music for days after December 8th. It made me feel so sad for him. Sigh. My thoughts came back to the present. I was, with my best friend in the whole world, seeing the closest thing to meeting John Lennon himself. We were in Central Park, which you probably know is in New York City, where John spent the last years of his life. This mosaic was just recently placed here by his wife, Yoko Ono, to honor his memory, in early 1985. It was August now. Miranda sat down beside me. "This is great, isn't it?" she asked quietly. I nodded, my tears finally coming and trickling down my cheeks. The song "Strawberry Fields Forever" was playing softly somewhere nearby on someone's portable radio. I listened to John sing "Living is easy with eyes closed, misunderstanding all you see." 'It is, and we do,' I thought. I wept quietly for John, because he was no longer here to share his music with the world. I listened to the rest of the song. Then "Imagine" began to play on the radio. "Imagine all the people living life in peace." I sighed. "You may say I'm a dreamer, but I'm not the only one. I hope someday you will join us, and the world will live as one." I had taken John seriously about that. I had a vivid imagination, and dreamed up all sorts of things. "Do ya wanna buy a flower?" I opened my eyes. A man carrying a tray of carnations stood before me. Usually I would've been annoyed at the man, but I was in a good "imagine" mood, you know. I bought a white carnation to put on the mosaic. A couple of flowers were on it already. Miranda decided to get a flower, too. We set the carnations down on the mosaic. "For you, John," I said. "For your soul you gave to the world," Miranda added. We both smiled, and stood next to the mosaic. "Imagine," I whispered, reading the word on the stone surface of the mosaic over and over again. Miranda sighed, and we both felt another set of tears coming on. We both wept together, thinking of the great man John Lennon, and all he had done. Suddenly, I heard voices in the hallway. I didn't know who they were (because I didn't know where I was), so I ducked in to closet nearby and shut the door. The room's door opened, and I heard a voice finish asking something. "...going now, Nell?" a deep male voice asked in a British accent. I thought I recognized it. But it couldn't be... I heard the room's door shut, and I pressed my ear up against the closet door. 'Could it be? How?' I wondered, listening. "Well, John, we'll be staying 'ere for the night," the man I assumed was Neil replied. "Now, Paul, I'll bring 'em in when they get 'ere." Neil replied - he souned just like 'Nell', so I figured they must be the same person. Wow. It was Paul, as I had thought. Paul McCartney. "Aye, Paulie, ya can't have it if it idn't here," a different male voice told him. I knew this voice - it was unmistakeable. It had to be George Harrison's. "Sod off, Lennon. Get your own couch," the Ring voice said. That voice had to belong to Ringo Starr! And it was John Lennon; Ringo had said his last name. 'This is too wierd,' I thought, rubbing my cheek, 'It's like my thoughts came true about being in the Beatles' hotel room.' I shivered from excitement and from being freaked out. I heard a door open. "I'm goin' down to the lobby to wait for the cases," Neil said. "Ta, Neil!" George called. The other boys echoed him. That name, I knew it from somewhere...aha! That was Neil Aspinall, the Beatles' road manager. And now I remember reading somewhere that the boys called him 'Nell' a lot. "I'll be back in a mo'," Neil said, shutting the door. I decided that, somehow, I had gone back in time, and was in the Beatles' hotel room, and they must be on tour. How I got here, I had no idea. But if I did go back in time, then the year could be 1964, 1965, or 1966. These were the years the Beatles toured. As I pondered over my thoughts, I heard footsteps approaching the closet in which I was hiding. My train of thought was broken as the door began to open. 'Oh no!' I thought. There was nowhere to hide in this closet, and since the Beatles were staying the night here in this hotel room, I would've been found sooner or later. I bit my lip and braced myself. The door opened all of the way, and who should be standing there but the famous Paul McCartney himself. My heart pounded hard. I (like practically everyone else in the world) considered Paul to be very cute. And now, seeing him in person was just wow! Much better than in pictures, I'll tell you that! He saw me and smiled. In his hand was his suit jacket. I swallowed hard (he was even cuter when he smiled! ), and tried to smile back. I kept telling myself not to freak out. "Why, hello there," Paul said, setting his jacket down on the floor. I forced another smile. I couldn't find my voice; I was too dumbstruck. "Eh, Paulie, talking to the coats again?" Ringo asked, laughing. "Naw, not this time," Paul replied, stepping aside so the others could see me. I walked out of the closet and waved weakly. I was embarassed and in awe. There they were, all four of them. Ringo Starr, relaxing on the couch, John Lennon lounging next to him, George Harrison in a chair across the room, and Paul McCartney right beside me. I just stood there like and idiot and stared at this miraculous scene. The Beatles with their moptop hair. They all exchanged glances, probably wondering why I was here and why I didn't faint or start jumping all over one of them. I finally found my voice. "Hi, guys, oh, well, I'll leave now if I'm disturbing you, of course, sorry, I didn't mean to, I mean, no, um, never mind, sorry again, you see - " I blurted out, heading for the door. "Hold up, luv," Paul said, taking my arm to stop me from leaving. My skin tingled where his hand was. "Don't leave now. Come and sit, and introduce yourself." I sat, right in the middle of the floor. Paul sat in a chair next to the couch. "So what's your name, then?" George asked me. I couldn't believe it. Here I was, talking to the Beatles. Who'd've thought? "I'm, uh, Lee. Leeanne Baker. It's, uh, a pleasure to meet you all," I said, smiling shakily. I tried to breathe normally, and calm down my racing heart. "Well, you probably know who we are, but in case ya didn't, I'm John," John said to me, smiling broadly at me. 'There he is, in real life. In person,' I thought happily. "Yeah, I know. Hi John," I replied. "Pretty neat shirt ya got there, Lee," Ringo said. I looked down at it. "Oh, thanks." It was a picture of the 'Please Please Me' album cover. I was immediately glad I hadn't worn a later Beatles shirt, so they wouldn't see their future, you know. "Here comes the big question," John said, "How'd ya get in 'ere?" I swallowed. "Oh, that. Well, actually, if I told you, you wouldn't believe me. I don't really believe it myself, to tell you the truth." The four raised their eyebrows. "Please, tell us," Paul said. I think the four still were surprised that I was still concious and talking to them! "Hmm. Gotta promise that you'll listen straight through, and believe me. I promise that I'm telling the truth," I told them seriously. "Is it that wierd?" Ringo asked. We all laughed. "Yep," I replied. I took a deep breathe and told my story, changing it a little. "Well, ah, I was in New York with my friend Miranda. We were there for our, uh, friend Jo - Joanna's funeral. A service was being held in, in Central Park." This was the best thing I could come up with on the spur of the moment. "So there Miranda and I were, crying quietly, and thinking of our lost - friend, and when I opened my eyes, wow, here I was!" I looked at their faces. I could tell they didn't believe me. John gave everyone and me a look. "Yeah, Lee, why didn't you just say you came in here and waited for us to come back." Why didn't I just say I was at the IMAGINE mosaic that was dedicated to his own memory? "Don't be rude," Paul said to John. "Ooo, Paulie's found a bird," Ringo teased. "Come off it, Ringo," Paul retorted. George spoke up. "So, Lee, you say ya just sorta appeared here? Why does that seem highly unlikely to me?" I sighed. "I'm telling you guys the truth. I have no idea how it happened. And on top of that, I must've gone back in time." The four of them looked at her. "What?" Ringo asked, "How'd ya figure that, luv?" I shifted my weight nervously. Now they probably think I'm really weird. "Well, uh, because I happened to be born in 1966, that's why. And the year must be..." I had no idea what year it was. "1964, luv," John replied, "You're not even born yet!" He laughed. "So, you're saying you're from the '80's or something?" George asked me. I nodded. "Yeah. 1985. I'm 19 years old." "Wo-oh. This's too wierd," Ringo said. John agreed. "Okay, future girl, prove it." he told me. I set my jaw. "Alright, smarty, I will. Look at this." I pulled my wallet out from my pocket of my flared jeans and removed my driver's license. I handed it to John. "Nice picture," he remarked. I made a face at him. He read the card aloud. "Leeanne Dorothy Baker, born 1966, on September 12th in Noblesville, Indiana - so that explains your accent - address, blah blah, phone number, blah blah, this card expires in May of 1990." He looked up at me. "Interesting." I pulled out a quarter. "Check out the date on this." Paul took it from me. "1978. Hmm." He passed it to George. "Okay, so ya say you're born in '66, and this quarter is from the future," John said to me. I don't think he or Ringo believed me yet by the looks on their faces. I rolled my eyes. "Okay, okay, still don't believe me? Name a song of yours, and I'll sing it to you. Any song. I happen to be a fan of yours, and know every single song." "Even the one I wrote in '69?" Paul joked. "Which one?" I replied in the same tone, smiling. "Okay," John said, "Sing 'I'll Cry Instead'." "Oh, that one's easy. Excuse me if I'm out of key." I cleared my throat, and started singing. "I've got every reason on earth to be sad, 'cos I've just lost the only girl I had. If I could get my way, I'd get myself locked up today, but I can't so I'll cry instead." I stopped. "There." John gave Paul a look. "Okay, that was easy. Sing 'Baby's in Blue'." He looked smug. I topped that look. "Actually, the song's name is 'Baby's in Black', and here it goes." I paused to enjoy the look of disbelief on everyone's face. "Oh dear, what do I do, baby's in black, and I'm feeling blue, tell me, oh, what do I do?" I proceeded to sing the rest of the song. I knew I had convinced them all. "Wow. No one but us has heard that song." Paul said in amazement. The others nodded. "What's the name of our new album we're gonna release in December?" Ringo asked. "Beatles for sale," I replied. "That's right. Guys, I think she's for real." He handed my quarter back to me. I stuck everything back in my pocket. "I am. I have no idea why I was sent here. I always have wanted to meet you guys, though, and go on tour with you to see what it's like," I told them. "But I was kinda from the wrong time period. And ever since Jo - oops." I stopped myself. Dumb! There I go, blabbing my mouth and almost telling John he was going to die. What a nice thing to say. However, no one seemed to notice. They were too hung up on what I had said before that. "You wanna see what it's like to tour?" George asked in disbelief. I nodded. "Ha!" John replied, leaning back, sneering a little. "I don't think ya wanna. This's only one of our first tours as the big bad Beatles, and I could live without it." "Yeah," I told them, "and Paul thinks touring will help with your publicity, and George doesn't really want to tour, and Ringo thinks it's great and likes to see new places." They looked at each other. "Uh, that's about right," Paul said. "Damn right, future girl!" John exclaimed, pulling out a cigarette pack. He offered one to everyone, including me. I declined because I didn't smoke. The other three took one, and I started to think as they lit up. "So, actually where am I? Is this America?" I asked all of the sudden. "Well, luv," Ringo said, tapping his cigarette ashes into an ashtray, "You happen to be in...uh, Paul, where are we?" Paul rolled his eyes and smiled. "We're in Los Angeles, California." My jaw dropped in disbelief. "And to think fifteen minutes ago I was in New York!" I exclaimed. George nodded. "That happens to us sometimes," he said. We laughed. Suddenly, there was a muffled shout from outside of the door. "Open this, please!" "Who are you?" John called back. "Nail pull! John, you let me in! These're heavy!" the male voice called. John snickered, put out his cigarette, and got up to open the door. "It's Neil with our cases," Paul told me. I nodded. I was wondering what he'll think of me. Neil came in, carrying five suitcases. He set them down by the door, looked up, and saw me. "Hullo, who're you?" he asked, a little surprised to see me. I wonder why. I smiled. "Hi. My name's Lee. Leeanne Baker." "She's from 1985, and we'd like her to come on our tour with us," Paul said. I glanced at him. They did? "Aye," agreed John, "she seems pretty nice, and has nowhere else to go. One minute she's in New York, and the next - BOOM! - here she is with us." Neil raised his eyebrows. "From the future? Whatever you say, boys." I could tell he thought they were making all of this up. I stood to shake his hand. "It's a pleasure to meet you, Mr. Aspinall," I said, trying to be polite to get on his good side. It was true that I had no place to go if he said I couldn't go on the tour. I didn't even know when I'd get home. "So, Lee, you're from the future, eh?" Neil said suspiciously. "She is, too," Ringo told him. "Show 'im the proof, Lee," George said to me. I pulled out my driver's license and quarter and gave them to Neil. He studied them and shook his head. "This's wierd," he mumbled, handing them back to me. "She even sang a song that we've not even put out yet," Paul added. Neil nodded. "Well, she seems polite enough," he commented, smiling at me. "I don't care if she comes." The four cheered, and I smiled. Wow. I'm actually going to go on tour with the Beatles! "But of course, Brian has the last say on this issue," Neil added. Oh. Brian? 'Oh, I bet he means Brian Epstein, the Beatles' manager,' I thought. "Aw, Eppy won't mind," John said, throwing a couch pillow at Neil. He caught it, and used it as a seat on the floor. "So, Lee, tell us about yourself," George said to me. I did. I talked about my family and my dog and cats, and told them I played to piano, viola, and guitar - Paul suggested I might play for and/or with them sometime - "Of course!" was my excited reply - and told them basically everything else about my fascinating life. I found it easy to talk to the Beatles. They were funny - John especially - and we laughed a lot. They seemed to think I was okay. Pretty soon, there was a knock on the door. "Who are you?" John called. Sorry - this chapter is too long to put all on one page - take this link to the next part, please. Copyright © 1998. Please do not copy, take use, download, etc. this story without my permission. Thank you, and enjoy!